Melt dark Candy Melts following package instructions. Remove the tops of the peanut butter cookies to reveal the peanut butter filling inside. Then add a little more creamy peanut butter to a Popsicle stick and stick it in the peanut butter filling and then place the cookie top back on. Dip cookies in melted chocolate and lay them on parchment paper. 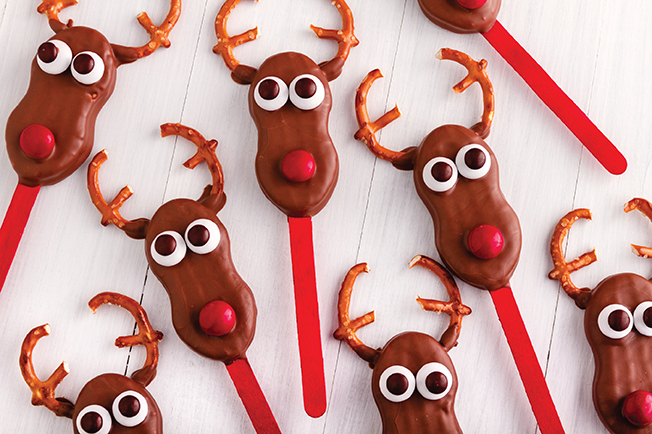 Before the chocolate hardens add your reindeer faces, such as white candies for the eyes, black icing or dark chocolate chips for the pupils and a red candy for the nose. Use broken pretzels for the antlers. Then place pops in the fridge or freezer to harden.